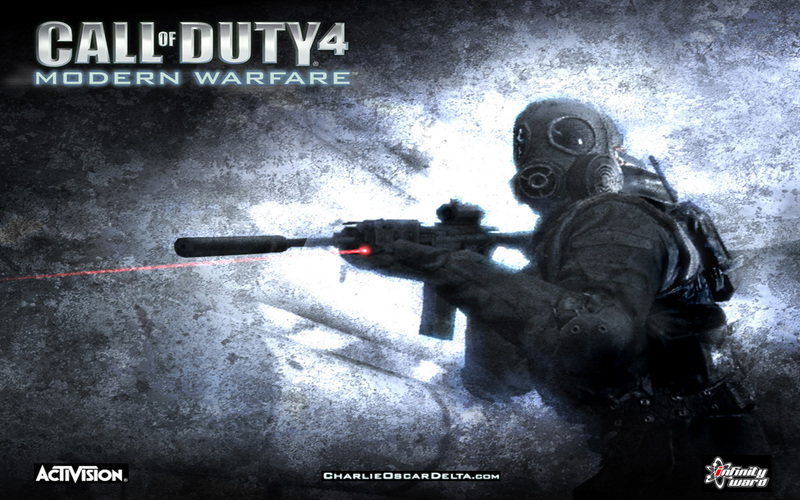 Call of Duty 4: Modern Warfare! The highly anticipated, winner of several E3 and Game of the Year awards has finally arrived, but will it's risky step into the modern world payoff, or will you want to return to the German trenches after you're done with the latest installment of the CoD franchise? Guns That Fire Without Bolt-Action, What Is This? All of previous installments of the CoD series has been set in WWII, but as we all know, that legendary setting will only last so long. This time around, CoD4 has decided to take a step in a new direction; setting the game in modern society, with modern (faster firing) guns, and modern scenarios. This background is a much-needed, and very much appreciated change in the CoD series. This time around, you will be facing off with terrorists in locations such as Iraq, deserted villages, and many other locales where those who threaten America reside. G.I. Joe The American Hero: As you progress through the game, you will be placed in the shoes of both a British S.A.S solider, and an American Marine, hoping to bring down the same target: A deadly terrorist that threatens America's citizens with launching a massive missile barrage upon America. The story, unlike in past games, is much more in depth and significant then before, and as you progress through the game, you will really care about the safety of your squadmates and what happens to them. As the story unfolds, there are MANY twists and turns that will leave you on the edge of your seat the entire time with key deaths, and climatic moments throughout. Only The Finest: The gameplay in CoD4 is some of the best I've seen in a long time for ANY shooter. There is a massive variety of weapons to choose from. From the popular AK-47 and M16, to MP5s and Golden Eagles, to Dragunov sniper rifles and Shotguns of many kinds. While you play the game, using a variety of different weapons trying to find a favorite (MP5 for me) each battle will be pulse pounding and exciting to the end with every enemy you kill will be an achievement to celebrate. MUTE HIM: The Multiplayer is a fantastic improvement over previous installments, and has a new added level of immense depth. Multiplayer plays very similarly to the single-payer campaign, but with a huge amount of difficulty thrown in. The matchmaking in CoD4 is, in a word, "questionable" because the first time you enter the online lobby, you will be matched up with players 20-30 levels above you. You are constantly matched with level 30-55 players, whether you are level 1, or level 50. But, after a quick while you will become a decent player, able to survive while leveling up every few games. But the matchmaking is not even remotely the worst part of the game. While MOST of the players on CoD4 are very friendly (albeit a little racist) a select few will turn their communicator and make weird and very annoying sounds that sound like "boing" or "blablablablabla" continuing this for 2 hours until they leave the room, or are forced to leave. Mute is your friend in this case. Rent vs. Buy: Overall the game is highly enjoyable, and the multiplayer is very deep and entertaining (with the exception of a few players that dampen the experience) and I would recommend this game to anyone with an Xbox 360. There are really NO major flaws in this game, and I tried to look. If anything could've been improved, it would be the matchmaker that constantly places you in rooms with players much higher then you. Still, this title is a great game that will keep you entertained for a very long time, and is a much better, deeper, more meaningful game then such other shallow FPSs *cough, Halo 3, cough*.